Some high school students are learning first hand about the job market. About 50 students from New Town High School, and Pikesville High School took part in a junior achievement job shadow event Thursday. 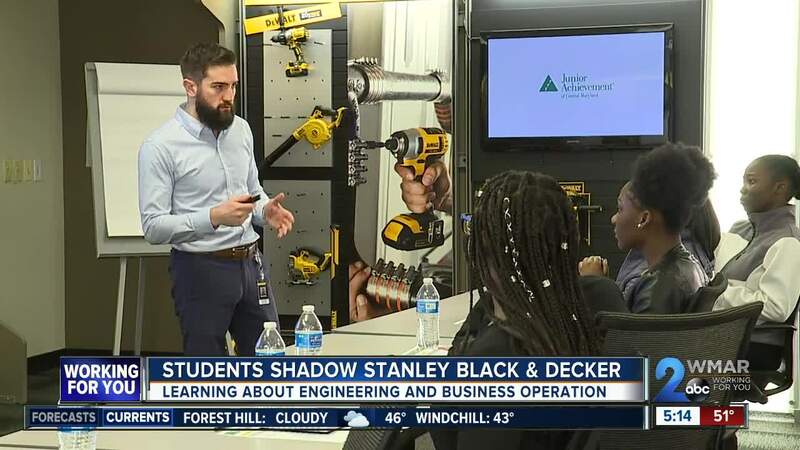 The students visited Stanley Black and Decker in Towson. Students talked to professionals about what they do, learned about internships, and got experience in manufacturing and engineering,. Next Friday, students from New Town are scheduled to visit a bakery in Halethorpe as part of the program. Some high school students are learning first hand about the job market. About 50 students from New Town High School, and Pikesville High School took part in a junior achievement job shadow event Thursday. The students visited Stanley Black and Decker in Towson. Students talked to professionals about what they do, learned about internships, and got experience in manufacturing and engineering. Next Friday, students from New Town are scheduled to visit a bakery in Halethorpe as part of the program.